GPGC Programme organized Alumni Homecoming & Career Development Day on Mar. 30 at Yun Chi Hsien, New Asia College. This year we invited 10 alumni from public sector, finance, consulting, IT companies and law firm to give current students in-depth sharing on career development. The Programme Manager presented awards to Top 3 GPA Ranking students. She was also glad to announce that one graduate of the 17/18 cohort and one current student have recently received admission offers from PhD programmes of CUHK and HKU. Congratulations! Click here to see photos from the lovely Saturday. The Asian Future Leaders Scholarship Program (AFLSP) awards up to 105 scholarships to high-caliber students in Asia each year to study abroad in leading universities across East Asia. Scholars are welcome to pursue the designated degree programs at any of the Anchor Universities (AU) or Participating Universities (PU), which include The Chinese University of Hong Kong (CUHK). The scholarship offers each student up to US$25,000 per year or a total of US$50,000 per scholar, which may be used towards university tuition, accommodation costs, and personal living expenses. (2) Prospective and existing Asian students of PU from Mainland China, Hong Kong SAR, Macao SAR, Taiwan, Japan, and Korea. AFLSF Scholarship only supports Asian students who wish to study abroad in Asia at one of the AUs or PUs. For example, prospective and existing Asian students from Mainland China, Macao SAR, Taiwan, Japan, and Korea who will study full-time taught Master’s degree programs at CUHK in the academic year 2019/20 are eligible for this exercise of AFLSP. Scholars must commit to attending the 3-week BXAI Summer Program. Please visit BXAI’s website at http://www.bxai.org/ for all eligibility, selection criteria and commitments. Students interested in applying for the AFLSP at AU should contact the relevant university direct. Students interested in applying for the AFLSP at PU should: (1) apply for admission directly with the university (prospective students only), and (2) complete the BXAI online application form on BXAI’s website (both prospective and existing students) on or before 31 January 2019. Further details of application procedures are also obtainable from BXAI’s website. Dr. Li Hak Yin will be leaving our Department in December 2018. He will be a visiting research fellow of the East Asian Institute at the National University of Singapore from Dec 2018 to Mar 2019, he will then take up an associate professorship of the Institute for International Strategy at Tokyo International University in Apr 2019. Dr. Li has been teaching GPGC programme since 2016. We thank him for his exceptional service to the programme, and we wish him every success in the future. GPGC programme is very happy to announce that THREE newly graduated alumni are granted Dean’s List (2017-18) of the Faculty of Social Science. They are YANG Yingxuan, XU Lan and LEE Pui Yeung. They are also awarded GPGC Dean’s List Scholarship. Congratulations! 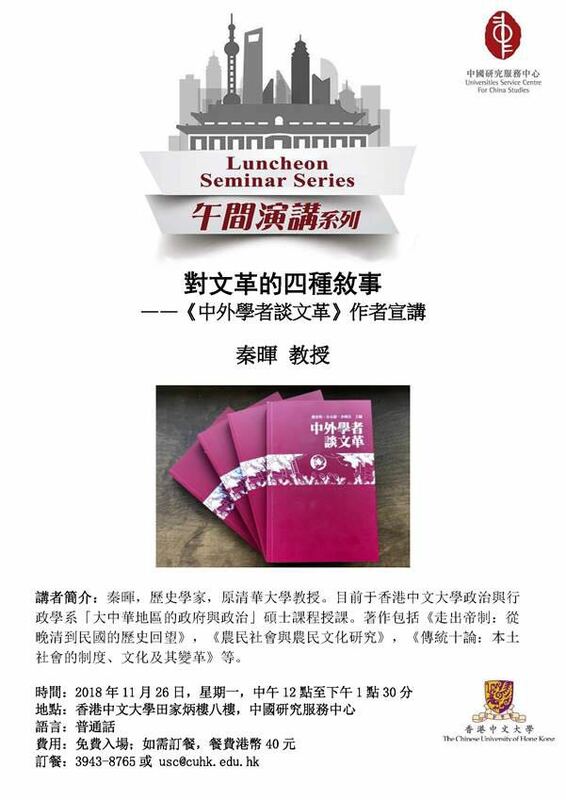 Professor Qin Hui, Adjunct Professor of GPGC, will give a talk (in Putonghua) on his co-authored book 「中外學者談文革」at 12:00 noon on November 26 (Monday). Anyone interested are welcome to join. Important notice for non-local applicants: When preparing your official transcripts, please make sure that first, there’s a stamp of “Registration Section” on your official transcripts; second, there’s an official statement about the Grading Scheme; and third, your average Grade Point Average (GPA) during undergraduate study. Official transcripts should be sent directly to relevant Graduate Division in a sealed envelope from the issuing university. Applicants who obtained degrees from universities in Mainland China are required to provide an Online Verification Report (中國高等教育學歷認證報告) issued by the CHESICC (學信網). If you exchanged abroad and your courses and grades are listed on your home institution's transcript, then you do not need to upload a separate study abroad transcript. If the coursework and grades for your study abroad program are not listed on your home institution's transcript, then you are required to provide a separate transcript from your study abroad program that shows the coursework and grades. Prof. Carlos Lo, Prof. Qin Hui, Prof. Li Lianjiang, Prof. Michel Bonnin and Dr. Li Hak-yin attended the gathering and gave warm welcoming speeches. This year Luo Hanning, Wang Xichen and Zhu Xinrong were granted “Government and Politics (Greater China) Scholarship.” Please click here for the photos of that day. GPGC welcomes Prof. Qinhui to its staff for the 2018-19 academic year. Prof. Qin Hui is a full professor retired from the Department of History, Tsinghua University and one of the leading historian and public intellectuals in China. Prof. Qin started from writing on Ming and Qing agriculture, and since has expanded to contemporary issues ranging from politics to economics and philosophy. He has published numerous scholarly books, which include among others 《走出帝制：從晚清到民國的歷史回望》、《農民社會與農民文化研究》、《田園詩與狂想曲：關中模式與前近代社會的再認識》、《經濟轉軌與社會公正》、《農民中國：歷史反思與現實選擇》、《傳統十論：本土社會的制度、文化及其變革》、《十年滄桑：東歐諸國的經濟社會轉軌與思想變遷》（all published in Chinese）. GPGC Programme organized Alumni Day & Career Talk on April 15 at United College Si Yuan Amenities Centre. This year we invited 5 alumni from education/media, finance, insurance, human resources consulting and IT companies to give current students an in-depth consultation on career development. The Programme Manager was also proud to share with alumni that one graduate of 15/16 and two current students have recently received admission offers from Mphil/PhD programmes of prestigious universities such as The University of Tübingen, Germany and National University of Singapore. Congratulations! Prof. Li Lianjiang and Tsao King Kwun attended the gathering. Click here to see photos from the Sunday. Prof. Vivian Zhan, Associate Professor and Acting Programme Director of GPGC 2014/15 have been invited to give the following talks in the past few months. If any of the information is useful for you, feel free to use it. For administrative reasons, our admission deadline for 2018/19 has been updated to 30 April 2018 on both Admission Website & Online Application System of the Graduate School. Mr. Busby, a political officer from US Consulate General in Hong Kong and Macau joined Dr. Li Hak Yin’s GPGC5003 class on March 19 for a talk on US-HK relations and HK between China and the West. The talk is well received by the students. More than 20 GPGC students attended a forum which was delivered by former chief executive Leung Chun-ying to discuss Mainland-Hong Kong relations at HKCEC on Nov. 6 2017. Please click here for some photos of that day. Invited by Brightway Hong Kong, and led by the Programme Manager, GPGC students visit the Phoenix TV at Tai Po Industrial Estate. They were warmly received by the Public Relations Manager, who guided the group around the Global News Centre, exhibition corridors and studio. Through a dialogue with the Deputy Head of Phoenix Chinese Channel, students learnt how the Hong Kong-based Chinese television broadcaster built its fame among highly-educated intellectuals in Mainland China, as well as the challenges it faces. Click here for some photos of that day. Professor Li Lianjiang, the Acting Programme Director of GPGC attended the gathering together with Prof. Michel Bonnin, Prof. Tsao King Kwun, Prof. Chow Po-chung, Dr. Yeh Kuo-hao, and Dr. Liu Chun. This year Chen Xin, Chen Xinyu and Chen Yuting were granted “Government and Politics (Greater China) Scholarship.” Please click here for the photos of that day. MSSc in GPGC is pleased to announce that we’ve invited Professor Wang Zhengxu from Fudan University to deliver a seminar at USC in June 7. All are welcome! GPGC Alumni Day 2017 took place on Mar. 18 at SCR Clubhouse CUHK. We were so thrilled to welcome 12 alumni who are based in Hong Kong to come back and reconnect with old friends and current students. Click here to see photos from the weekend. GPGC programme is very happy to announce that FIVE alumni are granted Dean’s List in the year of 2016-17. They are ZHOU Shunzi, LIU Mengqi, HAN Jiawei, SHI Shuai, and LI Teng. Congratulations! Scholarships have been set up for excellent applicants and graduates! The Programme Committee of GPGC has decided to set up two scholarships for students of the Programme with effect from 16/17 academic year. The first scholarship is named “Government and Politics (Greater China) Research Scholarship.” It is to honor the top 10 percent of enrolled students of the Programme who have achieved excellent academic records in their previous study and deploy high potential in the research on government and politics (Greater China). This year FOUR recipients were singled out by our Admission Committee based on their past academic performance. Each of them is granted a check of HK$10,000 and a certification. Congratulations to Xinyao, Li Mi, Yuxuan and Yongshi! Please click here for photos. Another scholarship is “Dean’s List Scholarship.” GPGC will grant each excellent graduate, whose name is on Dean’s List, a scholarship of HK$5,000. Same as previous years, GPGC organized an orientation programme for new postgraduate students this year on September 1st before semester starts. Please click here for the photos of that day. GPGC Programme organized the first ever Alumni Day activity on April 16 2016. We were so thrilled to welcome over 20 Hong Kong-based alumni back to campus to reconnect with old friends, teachers and current students. The function also served as career development consultation for our current students. Click here to see photos of the weekend.